Admittedly, I am a bit of a Disney Cruise addict. After going on over 15 sailings at this point, being on a Disney Cruise ship feels like home. So there I was on the Disney Wonder, watching The Golden Mickeys for what feels like the dozenth time and my jaw drops. Within the first five minutes, this show which I know like the back of my hand has now stretched beyond the proscenium and onto the walls of the theater via projection mapping. All of the sudden, the film strips that crisscrossed the screen on stage were spilling onto the walls and covering nearly half the theater! 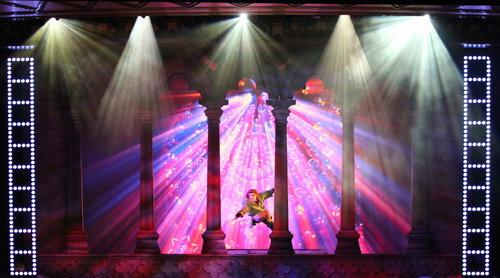 Throughout the show, the walls of the theater came to life with unique animations to enhance the action on stage. All of the sudden this show I had seen many times became exciting because I was waiting to see how the theater would come alive with each passing musical number. After doing some digging, I found the company who was responsible for the new Disney Cruise Line theater mapping animation. 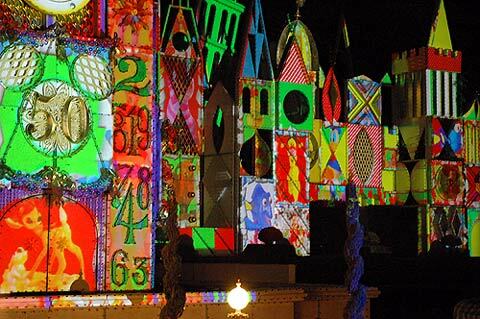 Eye Q Productions, based out of California, has been creating projection mapping and animation for stage production for all sorts of projects since 2003. Their first project for Disney actually dates back to 2005 at Disneyland. For Disneyland’s 50th Anniversary in 2005, the park needed additional ways to soak up the crowds. 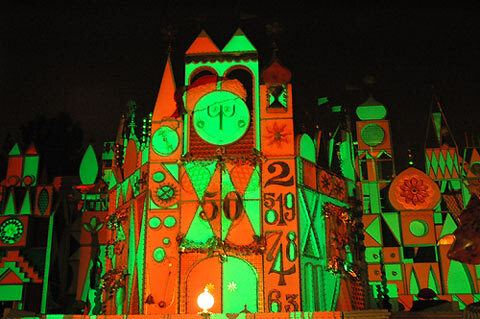 While projection mapping was fairly new to the world of themed entertainment (and theme parks) at the time, Disneyland created a new show that took place on the facade of it’s a small world. 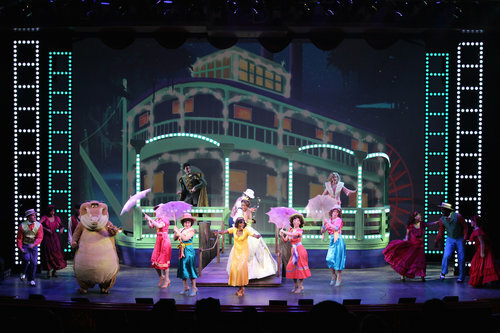 For the Disney Cruise Line, Eye Q Productions has helped design animation elements for many of their Broadway-style theater shows. For instance, if you’ve ever seen the Golden Mickeys on any of Disney’s ships, you’ll know that the pre-show red carpet event is an integral part of the experience. Guests are interviewed as if they are celebrities arriving at a star-studded award show just outside the Walt Disney Theater using studio cameras. Inside the theater, guests can see these interviews in real time as they are being seated, awaiting the show to start. Between guest interviews, in-theater cameras cut to empty seats that are being filled by Disney characters. Like Carl and Doug from “Up” or Wall-E and Eve from “Wall-E,” these augmented reality animations were created and designed by Eye Q Productions! Kids absolutely love this feature because it genuinely looks like the theater is being filled with Disney characters. Absolutely charming and extremely clever. Their most noticeable contribution is adding projection mapping to Disney Cruise Line productions on the Disney Magic and Disney Wonder. Not only were they the first ships to receive projection mapping, but they are the first cruise ships theaters in the entire industry to start using this technology. As you can imagine, creating precise projection mapping on a cruise ship is not an easy task. The boat sways to the movement quite a bit. Special mounts were created to hold the ten projectors in place to help compensate for the ships rocking and keep everything in alignment. In addition, the red and gold surfaces of the walls in the Walt Disney Theater proved to be difficult to work with. Basically, if you project red on a red surface, it blends in. Thus, everything that gets projected onto the walls of that theater was specifically created to compliment that color palette. Finally, there are some amazing special effects that were created for The Golden Mickeys by Eye Q Productions. You know that viral video that’s going around showing Sleeping Beauty on a parade float where dress changes colors every few seconds? While that’s just some post-production editing trickery, it really happens during The Golden Mickeys thanks to clever projection mapping. Even though we have only touched on some of the work Eye Q Productions has done for Disney, their work goes beyond theme parks and cruise ships. Check out their video above and for more information, visit their website! This entry was posted in Disney and tagged disney cruise line, Eye Q Productions, Projection mapping, The Golden Mickeys, Walt Disney Theater. Bookmark the permalink. Trackbacks are closed, but you can post a comment.